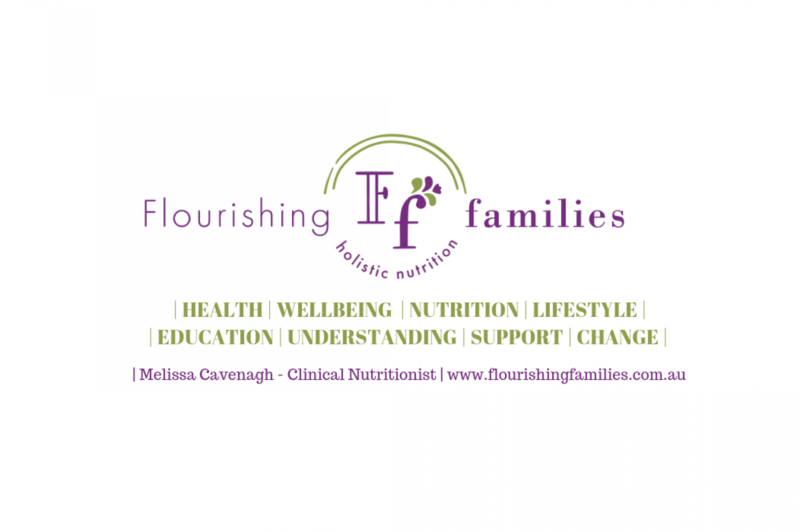 Melissa Cavenagh trading as Flourishing Families Holistic Nutrition ABN 39807177410, (‘we’, ‘us’, ‘our’ or ‘flourishing families’) recognises the importance of protecting the privacy of your personal information and will act to protect your personal information, as set out in this document. Personal Information: The type of personal information we collect may include (but is not limited to) name, address, date of birth, email address and phone number. Wherever possible, you can elect to remain anonymous when contacting us, for example if you are making an enquiry. Personal Information will also be held, when signing up to and opting-in for Flourishing Families subscription newsletter, should you choose to opt out of this additional communications, please email [email protected] with the subject “UNSUBSCRIBE” or use the contact details on the site to request you be ‘unsubscribed’ from the communications. We may disclose personal information for purposes including, to provide our products and services to you, if you breach out Terms and Conditions, or as required by law. However, certain third-party service providers, such as payment gateways, have their own privacy policies in respect to the information we are required to provide to them for your purchase-related transactions. For these providers, it is recommend that you read their privacy policies to ensure you understand how your personal information will be handled by these third-party providers. Google analytics: Our site uses Google Analytics to help us learn about who visits our site and what pages are being looked at. Our site will be provided with your computer ‘IP’ address, to enable us the details necessary to provide you with our service. These analytical services are used to improve our services and site. It also provides us with feedback on any errors or technical difficulties that may arise. Access: You may request details of personal information that we hold about you, in certain circumstances set out in the Privacy Act 1988 (Cth). Please contact us at [email protected]. An administrative fee may be payable for the provision of information, should we incur a fee to provide you with the required information. This fee will be disclosed to you, prior to you deciding to continue with the access request. We may refuse to provide you with information that we hold about you, in certain circumstances as set out in the Privacy Act. Any refusal of information will be advised to you, unless this would be considered unreasonable in the circumstances. Correction: We believe in keeping our records accurate and the accuracy of your personal information is important to us. If you believe that any information we hold on you is inaccurate, out of date, incomplete, irrelevant or misleading, please contact us by email at [email protected]. We rely in part upon customers advising us when their personal information changes. We will respond to any request within a reasonable time. We will endeavor to promptly correct any information found to be inaccurate, incomplete or out of date. If you believe that we have breached the Australian Privacy Principles and wish to make a complaint about that breach, please contact us on the above email address and we will endeavour to address your concerns as soon as possible. Should you believe that we have not accurately dealt with your concern, you can also contact the Office of the Australian Information Commissioner with your concern. Information about lodging a complaint is available on the Office of the Australian Information Commissioner’s website at http://www.oaic.gov.au/privacy/privacy-complaints. We are committed to ensuring that the information you provide is secure. Depending on the interaction with Flourishing Families, personal information may be stored both electronically or in hard copy. Regardless of the method of storage, we take all necessary precautions to keep your personal information safe from inappropriate: use, loss, access, disclosure, interference, alteration or destruction. However, you use www.flourishingfamilies.com.au at your own risk and we accept no responsibility, even if deemed negligent, in the event of affects to your privacy, related to security. Please note that no storage or transmission of information over the internet or interaction carried out online, can be guaranteed 100% secure. Whilst we will endeavour to keep your personal information protected and secure, we cannot guarantee the security of the information transmitted to us, or received from us. The exchange of information on our site or transmission of information between Flourishing Families and you, is carried out at your own risk. For general information about Privacy Legislation please contact the Office of the Australian Information Commissioner’s website located at http://www.oaic.gov.au. FOMO: Is It Ruling Your Life? WANT TO RECEIVE HEALTH INFORMATION TO YOUR INBOX?